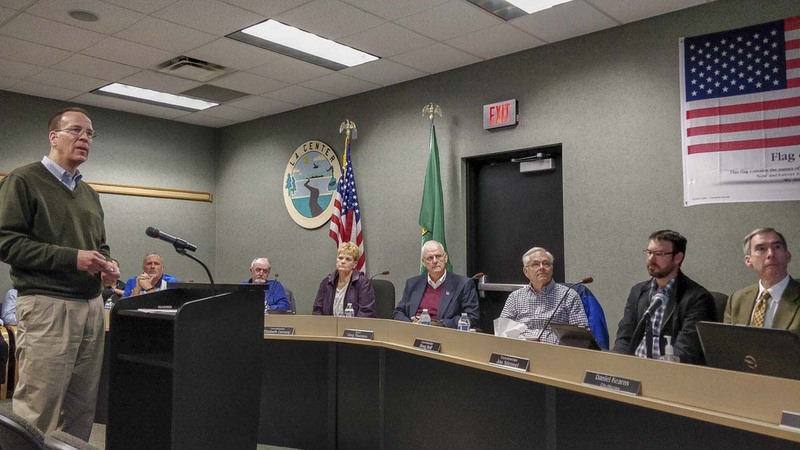 BATTLE GROUND — In a surprise move on Monday night, Battle Ground’s City Council members voted 6-1 against approving a one percent local property tax levy increase. The council was considering the increase as part of a set of fee increases leading up to the final budget vote for next year. The one percent property tax levy increase was expected to add $30,500 in additional revenue for the city, increasing the tax rate from $1.37 per $1,000 of assessed value to $1.38 per thousand. Adrian Cortez was the lone council member voting in favor of adopting the rate increase. New homes are taxed differently in their first year after construction than existing homes. That means the more new construction a city sees, the greater the chance that taxes on existing homes will stay the same or decrease. Battle Ground saw $75 million in new construction this year, far outpacing previous years, so it was unlikely that most homeowners would have noticed the rate increase. At least for this year. Despite that, some council members felt adopting the increase in a year that so many homeowners have seen massive property tax increases at the state level, primarily to fund added education funding, would have been a step over the line. Under state law, a city that declines to take the one percent property tax allowed can bank that capacity for future use. Hypothetically, that could allow an increase of more than two percent next year (for more details on how property taxes work for cities and counties in Washington, check out the Municipal Research and Services Center. Maggie Smith, Battle Ground’s finance director, said the process of banking the property tax levy capacity would put the city up against the clock, because it would require an entirely new ordinance. Since the Battle Ground council was not scheduled to meet again until after the Nov. 30 deadline to submit new fees to the state for approval, there will need to be a special meeting, likely Monday, Nov. 26, to vote on the ordinance. Battle Ground did approve a two percent increase in utility tax rates effective next year, as well as a modification to how water rates are calculated. The adjustment lowers the base charge from $14.40 to $10.85, but adds a higher rate for people using more than the typical amount of water. The city estimates that average consumers should see their annual water bill increase by approximately $31.88 next year. With the addition of sewer and stormwater rate increases, the typical homeowner in Battle Ground will see their utility bill increase by $7.35 a month, or just over $88 per year. The council is set to take up their full budget early next month, which is expected to total just shy of $14.5 million, an increase from the $13.1 million in this year’s budget. The city of La Center went a different direction last week, unanimously approving a one percent increase in their property tax rate for next year. Despite the increase, many La Center homeowners could actually see a slight decrease in their property taxes next year. Under state law, local municipalities of more than 10,000 residents can increase property tax levies no more than one percent, or the percentage increase in the implicit price deflator (a method of measuring price increases at the national level) on its highest lawful levy since 1985, whichever is less. In the case of both Battle Ground and La Center, the IPD would have been higher, so one percent is the maximum they could approve. It’s important to note that the one percent increase applies only to the part of property taxes collected for the individual city or county. An average priced home in Clark County pays approximately $11.13 per $1,000 of assessed value in property taxes, as of this year. Of that, around 62 percent goes to schools between local levies and the newly increased state school funding levy. La Center gets to keep around 11 percent of total property taxes collected, while in Battle Ground the number is closer to 15 percent. The local property tax increase would be only on the portion the city receives. Due to the complicated relationship between assessed home values and property tax calculations, the average homeowner in La Center should actually see their bill decrease. According to Henessee, a further one percent increase in Clark County’s property tax rate would mean an additional $3.41 per year in property taxes for a median-priced home of just under $350,000. La Center City Council is set to consider the creation of a stormwater utility next year, which could add an additional $8-9 to the utility bill of the average household. The city is currently one of only a few local cities that doesn’t charge for stormwater disposal.